Some areas of the garden are more challenging to plant, and among those are hillsides and shady areas. When you combine the two, you have an even more narrow group of plants from which to choose to get good cover and low maintenance. However, a select group of ground cover plants rise to this challenge. Virginia creeper is a fast-growing woody vine that is native to the eastern U.S. The perennial plant is well-adapted to shade, and can grow on the ground, a slope, or even a vertical surface like a garden wall.A plant this easygoing also runs the risk of becoming invasive, so attention must be paid to keeping it within the desired boundaries. The five-leafed vine is sometimes called American ivy, and can be planted in the spring or fall. The USDA Natural Resource Conservation Service recommends planting 10 seeds per square foot. The vine can also be established using hardwood cuttings. Liriope, also known as lilyturf, is a versatile ground cover that can handle both shade and a sloping grade. It's also a good choice for a large area with different levels of sun exposure, as most cultivars can handle both deep shade and full sun. Liriope has a grass-like appearance, and blooms with stalks of white or lilac flowers in the summer. Some cultivars, like L. muscari, offer taller, wider foliage in heights of up to 2 feet. The finer-leafed L. spicata variety is somewhat shorter, and produces flowering stalks that extend higher above the foliage. Both spread rapidly and can fill in a large area. English ivy is a spreading evergreen vine which forms dark green foliage 6 to 8 inches tall. This ground cover is best suited to shaded or semi-shaded areas. If quick coverage is desired, the Virginia Cooperative Extension Service recommends planting from pots or flats in the spring at 1-foot intervals. For a more economical approach, place plants 18 to 24 inches apart. 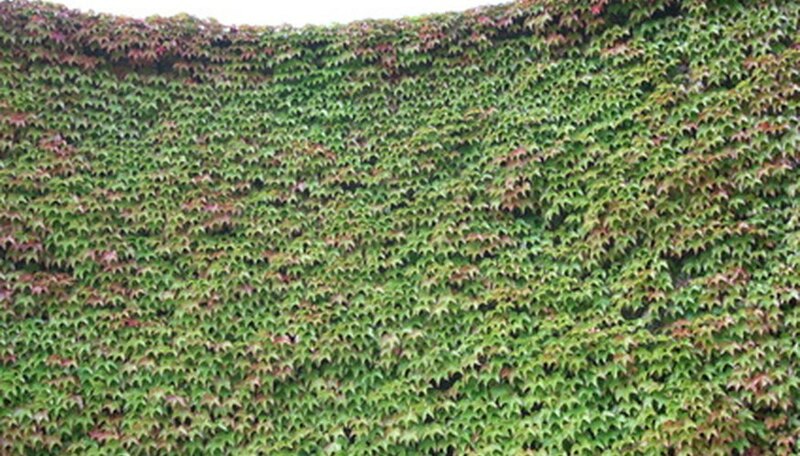 When planted near a wall or building, English ivy will climb those surfaces using aerial roots. Those roots have the ability to damage the mortar between bricks over time, so exercise caution in those locations. Periwinkle, also known as Vinca, is an excellent choice for a shaded slope. While the ground cover prefers shade, it can tolerate some sun. Periwinkle is usually planted at 12- to 18-inch intervals. However, if planted 6 inches apart, total coverage may be achieved in the first year. Periwinkle is available in different cultivars which offer variety in foliage size and color. It blooms twice per year, and reaches a mature height of around 6 inches. Buglewood is an attractive option for ground cover in a shaded area. Its rapid growth rate and dense coverage also make a good fit on a slope. Buglewood offers good color in some cultivars, with oval leaves in shades of purple and violet flowers in the spring. Buglewood prefers sandy, well-drained soil and attracts bumblebees.